At I-65 (exit 201) & US 24. Camping Cabins - Waterfront camping cabins include 1 King bed and 2 Twin bunk beds, A/C and heater, small refrigerator, porch, picnic table and fire ring (no kitchen or bathroom). You bring linens and towels. 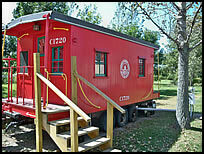 Caboose Rentals - Includes 1 Queen bed, 1 Twin bed, 2 additional fold-up bunks above, stocked kitchenette w/stove & microwave, bathroom w/shower, picnic table and fire ring. You bring towels and bedding. RV Rentals - Set up on a site in the campground. 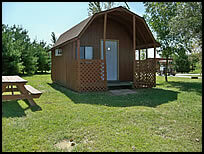 Sleeps 6, A/C and heat, full kitchen, bathroom w/shower, furnished except bedding & towels, on lot w/picnic table & fire ring. copyright 2003-2019 The Technological Edge, Inc. All rights reserved.